Today we’re going to talk a bit about Falernum. Falernum is a common tiki ingredient, and it can be either a syrup or a liqueur, but we all know it’s much better as a liqueur. Personally I am rocking some John D. Taylor Velvet Falernum. God bless the Haus Alpenz for importing almost everything that is good in this world. Falernum is flavored with lime, ginger, almonds, and cloves, but the cloves stand out far above any other flavor. I treat it as a low-proof clove liqueur, though if you make your own, you could balance it any way you wanted. I had intended to make my own for quite a while, but before I did that, I wanted to get a taste of the real deal, as a benchmark. The recipe I made here is from a Thursday Drink Night hosted by Kaiser Penguin, but his site seems to be having certificate troubles right now, so you might want to checkout the googled cached version instead. It’s a bit short on Falernum, but when I saw that it used one of my favorite amari, Ramazzotti, I had to give it a try. This drink also appeared in a Falernum-less version over at Two at the Most, and indeed, it was Stevi of that same blog who contributed it to Thursday Drink Night in the first place. Either way, I liked it, and I’m sure you will, too. As you can see, I took some liberties with this recipe by garnishing it with an orange peel, but fear not, the orange oil complements the orange notes in in the Ramazzotti perfectly. Aromatic drinks like this one just feel a little flat to me without the bright notes from a twist of citrus. You will notice, of course, that this drink is a riff on that same 6:3:1 template, but with Ramazzotti filling in for fortified wine, and with an extra part of a different liqueur. Some amari can fill in for fortified wine in a pinch; Ramazzotti and Cynar have similar flavor profiles to a fortified wine, bittered with wormwood, or cinchona. 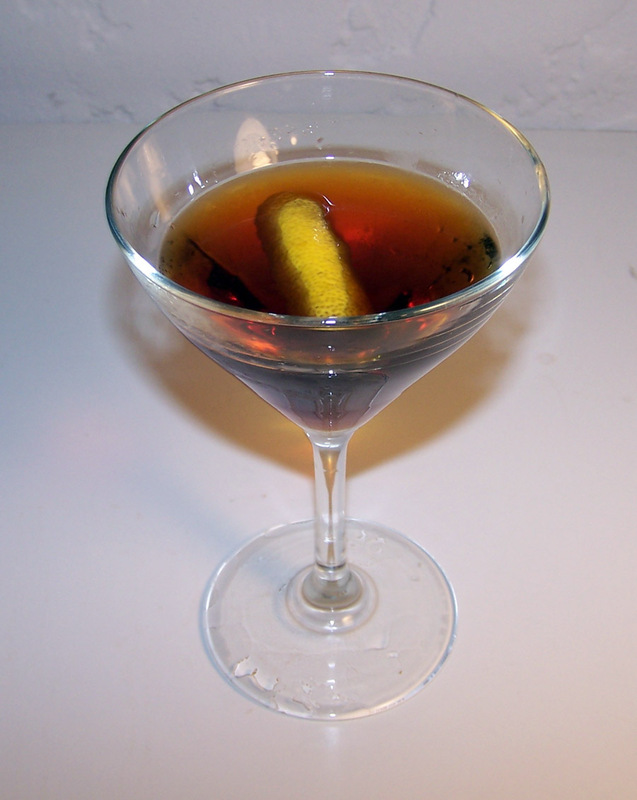 I once made a Manhattan with Ramazzotti instead of vermouth, and it was not a substantial departure. The cloves and chocolate worked really well to bolster the flavor of the amaro in this one, while the rum took a back seat, providing a foundation of oak and sugar cane. Categories: modern drinks | Permalink.